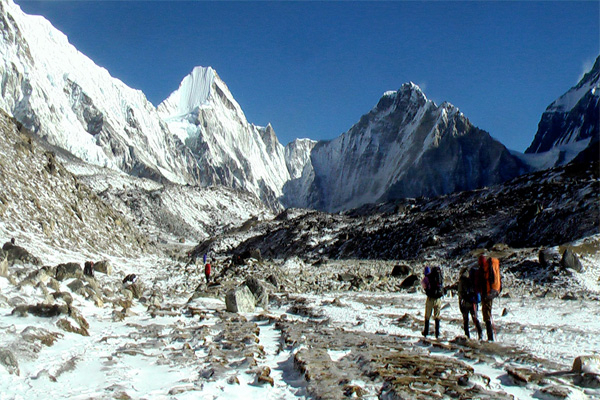 Everest Base Camp trekking is one of the popular and exciting routes in the world. It is an unbelievable experience that will introduce you to the scenic view of the snowcapped mountain in the Himalaya and reveals some of the most breathtaking scenery of the Himalayan region. Most of the traveler wants a glimpse of the world’s highest mountain and that’s the reason why the Everest Base Camp trek is so popular. The trek has a number of stunning attraction, not least of being able to say you’ve visited the highest mountain in the world. EBC trek gets you right Himalayan, more so than any other teahouse trek. There are some lovely village and Gompa (monasteries), the friendly Sherpa people and unique combination of Flora and Fauna make the trek unbelievable. Most of the trek is through the Sagarmatha National park, a UNESCO World Heritage Site (Sagarmatha is the Nepali name for Everest) and during the trek you will get a plenty of opportunity to observe the wild orchids and animals like: Musk Deer, Snow Leopard, Himalayan Black Bear, Birch, Juniper, Blue Pines, Firs, Bamboo and Rhododendron and many spectacular types of iridescent Pheasant. Everest Base Camp trek reaches a high point of 5555 m at Kala Pattar, a small peak offering views of Mt Everest and Khumbu Icefall. Ironically, the Everest views from the Base Camp 5364 m are actually quite unimpressive (in the world of mountain writer Ed Douglas, ‘Everest is like a grossly fat man in a room full of beautiful woman). Far more stirring is the graceful lines of surrounding peaks, such as Ama Dablam, Pumori, and Nuptse. Perhaps the best backdrop of the trek us found in the neighboring Gokyo Valley, off the main trail. In the past decade, the tourist crowds in the Khumbu region have slowly break the records of trekkers those who visit at Everest Base Camp trek (swollen to record numbers), nearly 36,000 traveler attempting the trek each year. The number of Trekker is doubtless have dropped since the earthquake, but after the year of earthquake the number of trekker is dramatically increased In the Khumbu region. From this time the movement of the trekker is restively high and at the peak season it is difficult to get the room. So the trekker is not have any other option to stay at hotel or tea house without sharing the rooms. At the trekking season you will may share the trails with 10,000 or so other trekkers. Facilities on the Everest trek are excellent. 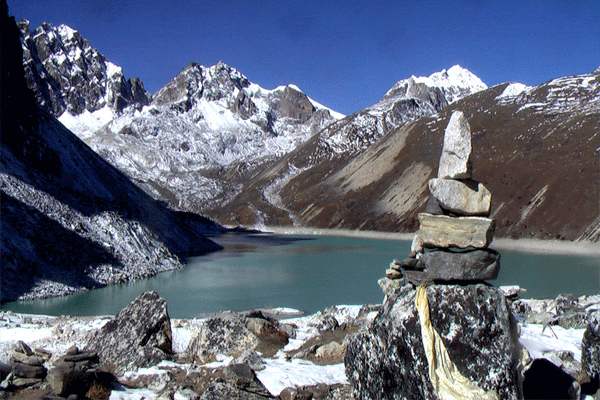 The upper reaches of the EBC Trek are through essentially uninhabited areas but lodges operate throughout the trekking season. Most of the peoples in the region us now involved/ support directly and indirectly with tourism, and the bookstore, trek-gear shops, bakeries and internet cafes in Namche Bazaar are look more like an alpine resort than a traditional Sherpa village. The walking on this base camp trek is (surprisingly) not all that strenuous, mainly because new arrivals can only walk a few hours each day before they have to stop for the night to acclimatize. It may be tempting to keep walking at the end of a three-hour day, but it’s essential to take it slow on the first 10 days of this trek. Your trip will begin with an exciting mountain flight to Lukla on the second day of your arrival at Kathmandu. From there the journey continues in the footprint of famous mountaineers Khumbu region for the walk into Everest Base Camp. On the way, you will see various colorful prayers flags and the Buddhist monasteries. On the third day, you will pass through the woods of rhododendron and magnolia forest. On the following day, you will reach at Namche Bazar, also a junction for the trekkers in a various trail of Everest region. Everest Base Camp trekking itinerary is designed including some of the most fabulous scenery and it passes through a number of small beautiful villages. Thus you can experience and get a feel for the isolated villages and the people living there. If you want more adventure trekking in Everest, Everest three high pass trek is adventure trek with EBC. If you want more adventure treking in everest, everest three high pass trek is adventure trek with EBC. for more information please contact us. Day 06: Trek to Tengboche Monastery (3860 m.) 5 hours. Day 10: Trek to Everest Base Camp (5365 m.) and back to Gorak Shep (5180 meters). 8 hours. Day 11: Hike up to Kalapatthar (5555 meters) early in the morning and trek down to Periche (4200 meters). 7 hours. Day 12: Trek to Namche Bazaar (3441m.) 6-7 hours. Note: Everest base camp trekking itinerary can be modify as per your request or different situation. We will spend a day here in order to acclimatize and adjust to the thinning of the air, as well as a short trek where a museum is celebrating the traditional customs of the Sherpa people. Today we hike up the Syangboche Airport around Everest View Hotel. From this point, we can see rewarding views of the Himalayas with stunning sunrise and sunset over the panorama of Khumbu peaks. Overnight at Guesthouse. From Tengboche, the trail drops to Debuche crosses another exciting suspension bridge on the Imja Khola and climbs to Pangboche amongst thousands of mani stones. Our uphill trek continues, taking us to the quaint traditional Sherpa village of Dingboche with its exquisite views of Lhotse, Island Peak, and Ama Dablam. We take our time so we avoid getting affected by the altitude. Overnight at Guesthouse. Trek to Lobuche (4910 meters) 5 hours. Today, the trail continues along the lateral moraine of the Khumbu Glacier and passes by stone memorials for climbers who have perished on nearby summits. We continue to climb as we are heading to the altitude of 4910 meters at Lobuche which is really just a few huts at the foot of giant Lobuche peak. Some breathing problems may arise today due to the altitude. Overnight at Guesthouse. Trek to Everest Base Camp (5365 m.) and back to Gorak Shep (5180 meters). 8 hours. This will be one of the most difficult yet rewarding days of the trek. Most of the morning in this day is spent climbing Mt. Kala Patthar, a small peak (by Himalayan standards) at 5555meters. The ascent is demanding but the climber gets the most magnificent mountain panorama: Everest, the highest point on the planet at 29028 ft, 8848 meters, towers directly ahead and on all sides loom the other giants, Nuptse, Pumori, Chagatse, Lhotse, and countless others. We make a quick descent to Gorak Shep, a tiny hamlet at 5180 meters then trek down to Periche. Overnight at Guesthouse. Trek to Namche Bazaar (3441m.) 6-7 hours. Finally, we return to Lukla where the trek began, which will seem like a lifetime ago; enjoying time to reflect on the trek as a group and the personal achievement of all those who took part and also giving you time to explore the town. Overnight at Guesthouse. Leisure day and farewell dinner in Kathmandu. Note: The available of fixed Departure date can be change or have a private Departure date as per your request. How fit do I need to be to go trekking to Everest Base Camp?? An average level of fitness is required. For trekking to Everest Base Camp? In Nepal, you'll need to consider the number of days you'll be out trekking. Most days include 4-7 hours of slow hiking. Altitude is not the biggest problem for this trek but there are a lot of up and down with many stone steps. Many people from all walks of life, ages and fitness levels have trekked to Everest Base Camp and it is one of the popular treks in Nepal as well as globally. Can my children go on the Everest Base Camp trek? When should I go to Everest Base Camp? Trek?, which is the best season for trek to Everest Base camp??? What equipment do I need to go trekking to Everest Base Camp Trek?